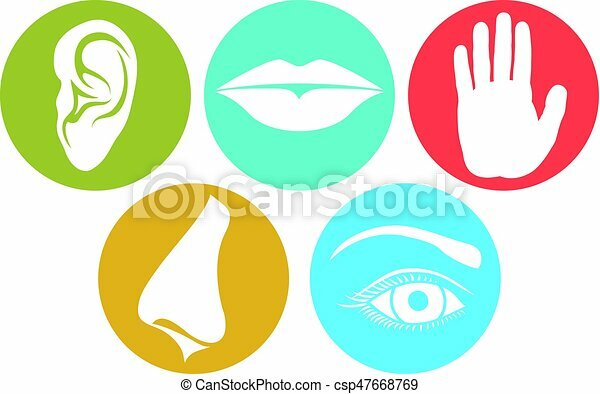 Five senses - sight, hearing, taste, smell and touch - schematic isolated vector icon illustration set of eye, ear, tongue, nose and hand on white background. 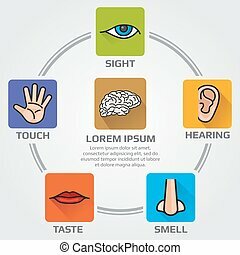 Five human senses sight, hearing, smell, touch and taste vector line icon illustration. 5 senses icons. Creative vector illustration line icon set of five human senses. Vision, hearing, smell, touch, taste isolated on transparent background. Art design nose, eye, hand, ear, mouth with tongue element. 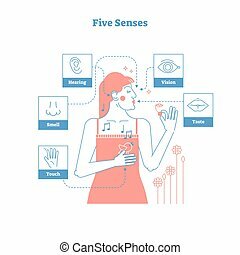 Five human senses, sensual experience artistic outline style graphic design vector illustration poster with female and 5 senses icons - touch hand, smell nose, hearing ear, vision eye and taste lips.